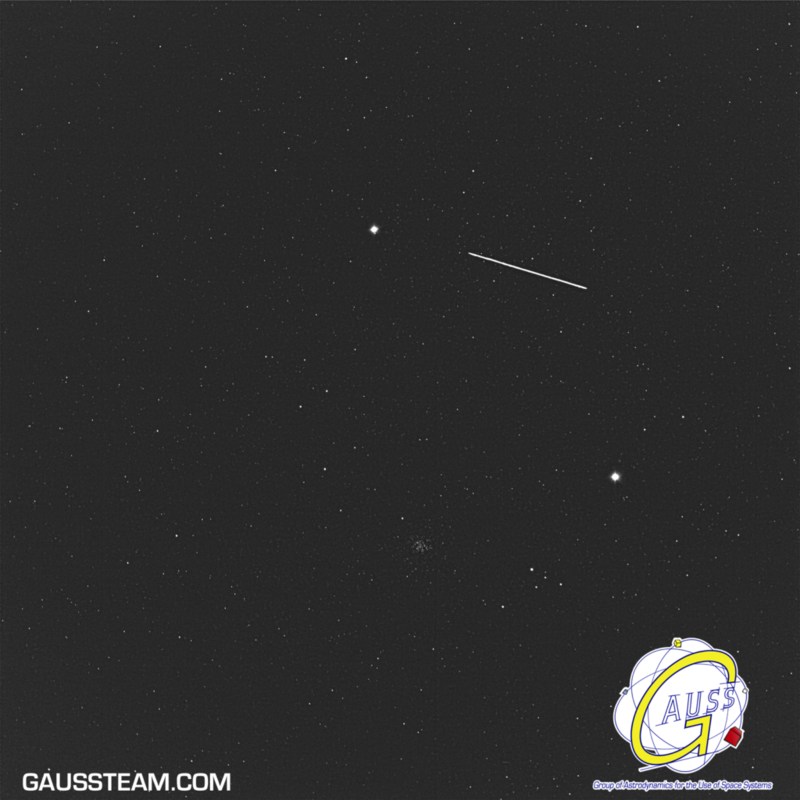 GAUSS has been actively monitoring the descent and reentry of the Chinese Space Station Tiangong-1, using CastelGAUSS Observatory. The image shown has been captured today, March 31 2018, 03:50:28 UTC, with an exposure of 0.5 seconds. The Space Station is the bright pattern, while the point north of it is Saturn, Mars is down to the right, and global cluster M22 is below. The IFOV of the picture is located at 18h 36m 48.602s RA, -23˚ 09′ 15.96″ DEC, in the equatorial coordinate system. GAUSS will continue to monitor the descent of the space station, which is forecasted to reentry on April 1st, 9:26 UTC. The TIANGONG-1 Chinese Space Station is predicted to decay tonight at 00:18 +-2h UTC, April 2nd 2018. Given these predictions, the object will not be passing over Europe or North America during reentry; it will not be possible to observe it from Central Europe. The delay in the reentry has been due to the transient variability of solar activity, which modified Earth’s upper atmosphere density profile.